As a division, the Premedical students are starting a new task force called Women Matter, Period. 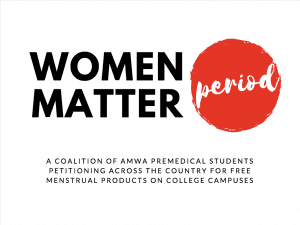 The aim of Women Matter, Period is to help members across the country to start petitions for free menstrual products on their college campuses by providing information and resources. This idea sprung from the recent success at various institutions across the country. There is a short list of universities that currently offer free menstrual products on campus, including Brown University and Florida State University. Our goal is to increase the number of schools on that list acknowledging the importance of women’s health. We are currently compiling a guidebook for these students on how to get involved with Women Matter, Period and how to get more involved in public health policy and advocacy in general. Please check back soon for more information! Tampons and pads are often seen as luxury items in today’s society. For those of us who menstruate, they are necessary. And yet, many people simply do not have access to these items. Some will use a pad or tampon for too long because they can’t afford buying more, causing medical difficulties. Several schools have successfully convinced their administration to offer free tampons and pads for students. A normal biological process should not impede the education of those who cannot afford such products or because there are not adequate supplies on campus. Free the Tampons Foundation has shown that the cost of providing free menstrual products for an entire year is just $4.67 per student. If not providing free products, campuses should at least offer an opt-in program where students can pay a one time fee each year allowing them access to these products with their school ID cards. To add on, there is such a large stigma around menstruation. Tampons and pads are seen as taboo items. Too many times have we all had someone respond in disgust to a wrapped, clean, tampon. These items are also heavily taxed in most states, while “medical necessities” such as dandruff shampoo or Viagra are tax-exempt. Some states are already passing bills to stop taxing these products and other legislation is being introduced in states like Wisconsin that demands menstruation products to be free in public restrooms. Tampons should be treated like toilet paper or free condoms. 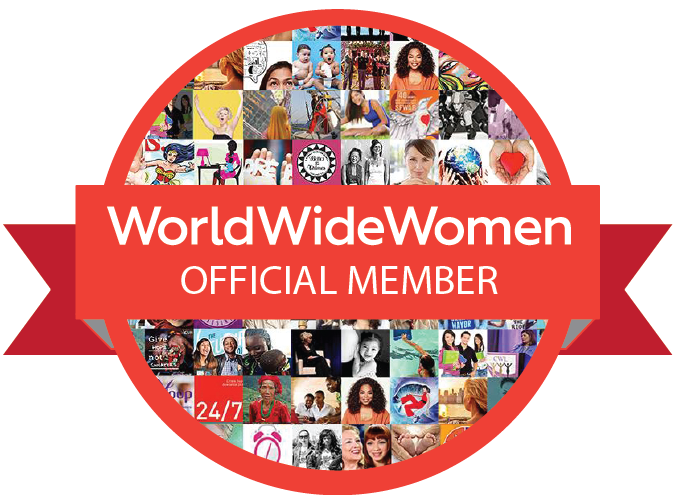 Let’s show those who menstruate that their needs and comfort matter. University of Central Florida‘s Knights Matter, Period. 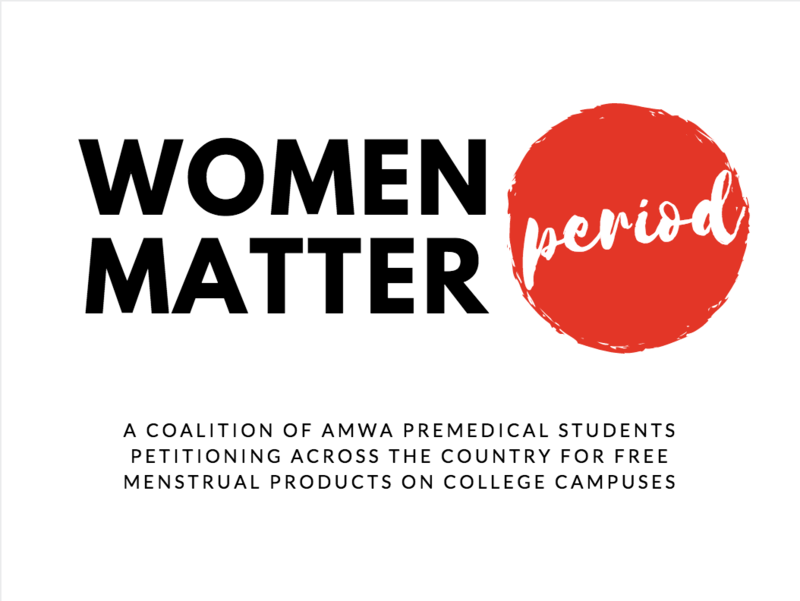 petition was started in February 2018 by their Premedical AMWA Branch as our first campaign. UCF’s Student Government Association added free menstrual products to one bathroom in the center of campus less than a month after the petition began! Mailman School of Public Health at Columbia University‘s “Women 4 Women” student organization partnered with AMWA to start the Lions Matter, Period. petition going live in November 2018.